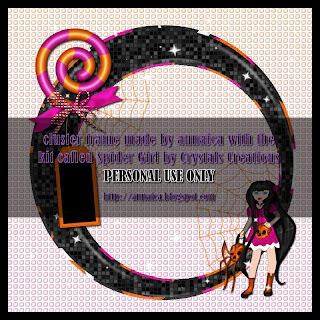 Here's a cluster frame I made with the FTU kit called Spider Girl by Crystal's Creations. You can find this kit HERE. The cluster frame is for personal use only. Click the preview below to download a copy for yourself, and send others here to this post if they'd like on too! Hope you like it :) Leave me a comment to let me know what you think! Below is a Gimp tutorial on a tag that I made with this cluster frame... so stick around! I used a FTU mask (HalloweenMask5byJenny) in a great Halloween Mask pack you can get over at the Creative Misfits blog, HERE. 1. Open the cluster, remove background and copyright layers. Add a layer, fill with black. Use the ellipse select tool to make a circle where the frame is and go to SELECT>INVERT and EDIT>CLEAR on the black layer. 2. Click and drag the mask into the canvas, use the scale tool to make sure you can see the edges of this mask behind the frame. Then go to COLORS>INVERT and LAYER>TRANSPARENCY>COLOR TO ALPHA. This will make it transparent. Then go back to COLOR>INVERT and add noise by FILTER>NOISE>RGB NOISE with settings at 20/20/20/0 and correlated checked. 3. Use the text tool and type out whatever you want the background to say. I just wrote SPIDERS and copied it about 100 times. Then I right clicked on this layer in layers box, chose ADD MASK and when the next window pops up make sure the top box is checked (WHITE FULL OPACITY) and click add, then click on the BLEND TOOL and make sure the gradient is set on four bars with the shape selected as radial. Then click and drag outwards toward the corners of the tag and let go. This might take a few tries to get the way you like. Just click EDIT>UNDO until it's right. Then right click on the layer in layers box again and choose APPLY LAYER MASK. 4. Add the tube of choice. Do not forget to add the copyright symbol, artist's name, their website and your license number, if applicable. I just love the colors of this tube by Tamadya :) For the close up, I merged the layers of that portion together (right click and merge down), then went to COLOR>DESATURATE. I right clicked on the black circle layer we made earlier and ALPHA TO SELECTION then clicked on the close up tube layer to make it active in the layers box, SELECT>INVERT and EDIT>CLEAR... For the full tube, I merged the layers I liked together, then scaled it down a bit. Add a drop shadow by going to FILTER>LIGHT&SHADOW>DROP SHADOW with settings at 6/6/12. 5. Add a drop shadow with same settings you just used to the cluster frame. 6. I added the name in black with a font called Spider Web Block. Then right click, ALPHA TO SELECTION, SELECT>GROW by 2, add a new transparent layer, fill with green picked from the bow of the tube (use the color pick tool), then add noise with same settings as earlier. Add a drop shadow to this too. 7. Save your tag as .xcf so you can go back in and make changes if you need to, layer by layer. But when you like what you've done, use the rectangle select tool to crop around the tag and go to IMAGE>CROP TO SELECTION. Save as .png and you're done! Thank you so much for this post. 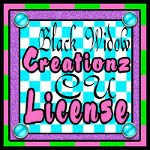 I want to let you know that I posted a link to your blog in CBB Digital Scrapbooking Freebies, under the Page 1 post on Sep. 21, 2012. Thanks again.